(Anderson 1986) (Intersectional) A strong plant of symmetrical form supporting large semi-double lemon yellow flowers with a lemon fragrance. Blooms to 9 inches or more on established plants. (Hollingsworth 1984) (Intersectional) A Court of Honor winner several times at the national peony show; bright butter yellow single flowers that have muted scarlet red flares at the tips; a vigorous, rapidly spreading bush with superb foliage that stays almost impeccable throughout the spring and summer. (Anderson 1999) (Intersectional) One of the loveliest of the recent crosses between peonies and tree peonies, also known erroneously as Itohs; 4 to 6 inch blooms are a unique color blend of peach/salmon that changes to yellow/cream, while the guard petals display shades of pink; 22 to 24 inches in height; excellent vigor. (Prof. Herald Fawkner, Falköping, Sweden 2001) Massive bomb-style double with an unusual combination of colors--vivid lime green buds open with cream-buff guards surrounding a greenish ball center which turns to yellow featuring several shades of yellow intermingled with apricot peach; needs several years to show true colors and awesome size; tetraploid; some pollen and seeds; tall, strong stems but the heavy flowers may need support; flower shown is first year in our garden. (Pehrson/Sidel 1989) (Intersectional) Soft, light greenish yellow intersectional hybrid; robust, upright stems hold 8 inch flowers above the foliage; excellent performer with long lasting blooms; choice. (Orville Fay 1959) Huge pale yellow single to semi-double on tall stems; after a show of pale sulfur yellow, the flower fades to ivory; the 32 inch stems usually don’t need staking; takes 3-4 years for the plant to look its best, though the foliage leaves much to be desired, so best to grow it in the back of the border; nice in a bouquet with some of the corals. (Hollingsworth 1992) (Intersectional) Medium-size to large flowers of clear yellow with a large dark purple red flares at the base; vigorous plant about 26" to 30" tall forms a substantial bush with attractive light green foliage; dependable bloomer. 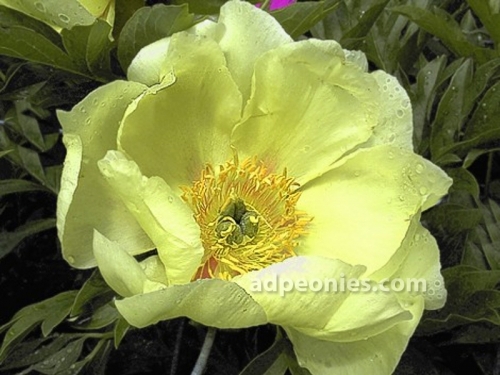 (Tolomeo 2006) Bright yellow fully double flower brings the notion of a yellow peony to a new higher standard; deep inside, but hidden by all the petals, are pink flares and light green carpels topped with pink stigmas; petal edges fade to white as the bloom matures; height to 28 inches; excellent. (Anderson 1999) Semi-double to double very soft creamy yellow flowers have a carnation shape and are on long stems carried well above the foliage; apricot hues emanate from the center; light fragrance; forms a mound 28 inches tall. (Seidel 1989) Pastel creamy-pink double with stamens interspersed; a landmark peony that is, among the hybridizers, changing the course of history for peonies, as many progeny are already introduced or in the works; fertile both ways; 30 inches plant height with semi-glossy foliage. (Caucasian Mountains) We are able to offer a limited number of divisions from mature plants; these are not seedlings, rather plants we continue to propagate from the Goldsmith collection; sulfur yellow blooms, pink tipped carpels, distinctive foliage and those famous seed pods. (Roy Pehrson's Best Yellow 1982) Large soft, but true yellow single flower with good, solid substance; a medium height plant with strong stems and dark green foliage; usually some side buds; vigorous grower.